Educating clients about the importance of addressing vapor intrusion risk on today's real estate deals is one of the top technical challenges that environmental professionals face. 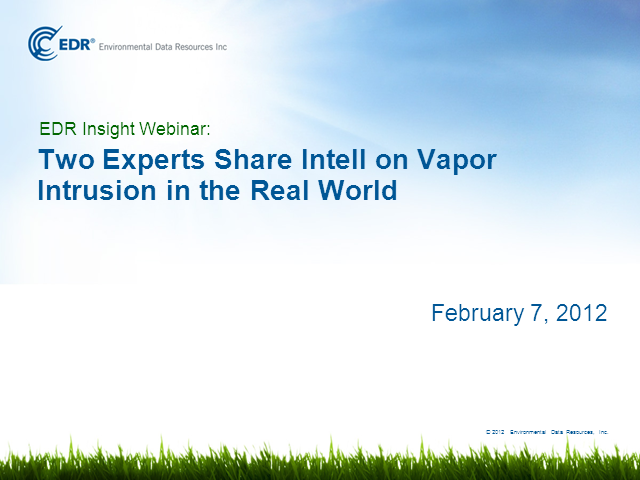 Join us as two vapor intrusion experts share their experience from the field. With the science evolving at a rapid rate, VI is the unseen villain that is complicating real estate transfers, financing/re-financing options and brownfield redevelopment. As property transactions get underway after a long downturn--and a large number of properties begin to change hands due to foreclosures, workouts and distressed asset deals--it is critical for environmental professionals to understand how VI, even on properties with NFA letters, can create liability for property owners, tenants and lenders. One important development involves EPA's efforts to make dramatic changes to its Draft 2002 VI Guidance. David Gillay, a leading environmental attorney, will cover the most significant proposed changes to the EPA's VI guidance from a legal perspective and what these changes mean for Phase I ESA standard operating procedures. Gillay will also provide several recent cases involving VI that highlight the importance of proactively addressing risk upfront. To help environmental due diligence professionals better understand the VI pathway and its implications for increasing a property purchaser's potential environmental liability, John Sallman, a Senior Principal and Environmental Department Manager at Terracon Consultants, will present on his experience educating clients, how he deals with client resistance, why the VI opportunity differs in states that have guidance versus those that do not, what ASTM's efforts to revise E 1527-05 might mean and why firms need to proactively address VI with clients. Sallman was recently chosen to lead Terracon's Vapor Task Group and will also share what his firm is doing to maintain an internal dialogue on this important topic. David Gillay, Barnes & Thornburg and John Sallman, Terracon Consultants, Inc. Competitive pressures are requiring real estate lenders and investors to complete underwriting and due diligence more quickly and cost effectively than ever, but not at the expense of prudent risk management, or for regulated banks and credit unions, compliance. One of the most time consuming and costly components to lending is the data collection and analysis required for underwriting, especially the appraisal procurement and review process. While technology exists to streamline the process, the reality is most lenders still use excel spreadsheets, word processing software and email to support the process. Join this complimentary webcast where we’ll demonstrate how technology is transforming the appraisal procurement and review process. See how some lenders are reducing appraisal cycle time by as much as 60%, while at the same time building powerful business intelligence by capturing valuation and other data. The new EDR FieldCheck gives you more control over your Radius Map reports than ever before. Move and plot records with the help of Lightbox’s crystal clear base maps, current aerial photography, tax maps and other advanced features. With this update, you'll be able to quickly and easily apply your knowledge about environmental records to refine search results. During the webinar we’ll demonstrate the new FieldCheck and provide a refresher on the power of Lightbox. EDR is making big improvements to FieldCheck™, so you can move or remove records using the tools in Lightbox, such as crystal clear basemaps, current aerial photography, tax maps and more.The improved FieldCheck is launching soon, join us to hear what is changing, see a demonstration the application, and ask questions. Despite the doomsday headlines about store closures, there is a great deal of excitement and energy in the retail sector. Demand is high for redeveloping older, obsolete sites in areas with promising demographics. Technology is playing an important role is helping retailers identify the most promising sites quickly and efficiently while proactively managing risk. This webinar brings together retail sector experts Gregg Katz from the Atlanta Shopping Center Group and Stephanie Cegielski from ICSC to address the latest trends impacting the retail sector and how technology and data play a key role in site selection. The session is moderated by Dan Welby from EDR. The last 15 minutes will allow for Q&A. We hope you’ll join us as we explore how your team can save hours per property using PARCEL for portfolio projects. Business conditions for the environmental industry are currently strong, particularly in infrastructure, transportation and commercial development markets. Still, forecasters are predicting the market will begin to experience recessionary conditions in the next 18-24 months. What’s your strategic plan? Are you positioned to benefit from any market changes, and what will be the opportunities and challenges? Join us for this timely webinar and come away armed with the tips you need to position your firm for growth. Al Spiers, 2020 Environmental Group Founder and CEO, will give attendees proven strategies for developing an effective strategic growth plan. Topics will include: what markets are hot and not; strategic growth plans for expanding into new markets and geographies; improving key performance metrics to support investment strategies; and opportunities for using M&A as a growth strategy. This includes companies that may be considering selling and merging with a new, larger strategic partner. The updated SOP was released by the SBA last Friday. EDR is pleased to host Part II of last week’s webcast where we’ll focus exclusively on changes to the environmental guidelines. This 20-minute webinar is a must attend for anyone originating SBA 504 or 7a loans. Version J of SOP 50 10 5 represents the agency’s first update to its environmental guidance since 2014 (when it adopted the revised ASTM Phase I E 1527 standard). EDR’s James Haberlen will provide a timely update on what this round of changes mean to the environmental due diligence required on any loans seeking the SBA’s approval. With commercial real estate prices leveling out—and even dropping in some areas—interest rates on the rise, and the likelihood of another cyclical market downturn in the next 18-24 months, what should lenders and investors be doing differently now to protect themselves from property environmental risk? What environmental risks are tripping up property deals? What are the risks of ignoring vapor migration risk? Two attorneys will share their observations on common mistakes in due diligence, drawing from real-world case studies and provide specifics on how underwriting should change at this stage of the commercial real estate cycle. This timely track will distill the headlines into real-world intel about how the priorities of the U.S. EPA are taking shape in a Trump Presidency. Overmeyer will share the U.S. EPA's latest budget forecast, the recently released regulatory agenda, and likely areas of policy focus for site assessment and cleanup. The industry's only application to screen for vapor encroachment risk will soon be new and improved. We're moving the VEC App to Lightbox, saving you time. These updates will also include major improvements to key VEC App features like the ground water flow tool, filtering, report output and more. Join us for a preview of the new VEC App. Points on a Map, But Where? With every map EDR delivers to you, we've harnessed the power of tax parcels to locate property records. Rather than simply plotting sites along a street, we've matched them to actual properties. Join us on as we present a brief history of georeferencing, why location accuracy matters, and how EDR has created significant improvements to location data with Tax Parcel Georeferencing. EDR's CEO, Chris Aronson, and our product team will introduce product improvements that change the fundamentals of data review, empowering you to do you best work faster. • Property Boundaries on your Historical Sources, to quickly locate your target property boundary on your aerial photos, topos, and Sanborn® Maps. • Improved EDR Lightbox®, newly updated and streamlined, with superior content and an intuitive interface. Join us as we present our most exciting products advancements ever. This 1-hour session will help ensure you and your team make the most of these exciting new features. Whether you are new to the environmental due diligence field or a seasoned veteran, this webinar offers something for you. EDR Insight is honored to bring you the expertise of Grady Shields, an attorney with Wyrick Robbins Yates & Ponton LLP. Shields brings over 30 years of experience practicing environmental law, assisting clients with environmental due diligence and transactions, and counseling lenders on environmental issues. At this webinar, Shields will share his insights on seven important issues impacting environmental due diligence in commercial real estate lending. This timely event will cover some of the latest environmental risks, like vapor migration, being pushed to the forefront, new emphasis on risk management tools like environmental insurance, the intense pressure on lenders by regulators and more. Take advantage of this opportunity to get some free advice from a trusted voice in environmental risk management. -trends being driven by the regulators. Project Managers (PMs) are the key to a professional services firm's success. Yet many firms promote technical people into roles they are not prepared or ready for. As a result, project profitability suffers and there is frustration at every level of the organization. By enabling project managers, through financial and systems training, automation, and accountability measures, the firm's profit margins can increase substantially. Jewell, a thought leader and expert in AEC firm profitability. has more than 28 years of business management consulting experience, and unsurpassed knowledge of the AEC industry. In addition to this role, she is the original founder and current strategic advisor of Acuity Business Solutions, a Deltek Premier Partner and consulting firm that works with AEC firms to support business profitability through web-based enterprise management technology. She is the Amazon best-selling author of the book “Find The Lost Dollars: 6 Steps to Increase Profits in Architecture, Engineering and Environmental Firms.” Jewell has built and run a successful consulting practice, and is a highly sought after speaker at industry events and conferences. Her past speaking engagements include AIA, ACEC, SMPS, Design and Construction Network (DCN), Society for Design Administration (SDA), Zweig Group (formerly ZweigWhite), PSMJ, ROG Growth and Ownership Conference, Project Management Institute (PMI), Deltek Insight and Business of Architecture (BOA). The new Clean Water Rule has significant implications for the way property due diligence will be conducted throughout the U.S. by altering the definitions and categories of jurisdictional waters and wetlands relating to the discharge of dredged/fill material into Waters of the U.S. These changes have the potential to greatly affect anyone involved in property assessments, land use, planning, development or lending. Attempts to block its implementation made for a dramatic late summer and early fall. Tune into this time-sensitive event to ensure that you don’t miss out on important updates, the timing of the new revisions, and more importantly, how these changes impact the work you do, particularly for properties on or adjacent to waterbodies and wetland areas. Don’t be caught off-guard. The new Clean Water Rule impacts the work you are doing today and could drastically impact the work you do tomorrow. Tune in for the latest! Do you know where the market for property due diligence is heading? How is your business performance this year compared to industry benchmarks? How confident are you in your business forecast for next year? • Is my business over- or under-performing the overall market? • What story does ScoreKeeper’s output tell about the regions driving the strongest 3Q growth? • Is my state among the top 10 fastest-growers this year? • Are the hottest mid-year metros still hot or cooling? And if so, who are the new entries taking their place? • What do the latest data on market indicators impacting demand for your services say about the future business climate you’ll have to contend with? • How aggressive should your business forecast be for 2016? How about 2017? Concentrations of credit, particularly those related to commercial real estate loans, have been a common factor in bank distress during economic downturns. Since the financial crisis, regulators have been laser focused on ensuring that the nation’s largest financial institutions – those with $10+ billion in assets – have sound stress testing and capital planning programs in place to ensure financial stability. -What is a stress test? -What is capital adequacy stress testing? -What are the regulators’ expectations? -What are the larger banks doing? -What is the current state of stress testing? -What do stress testing results look like? -What macroeconomic variables go into projections? Recent enforcement actions by bank regulators are heightening the need to establish formal policies for third party vendor management. Financial institutions that use outside firms for all types of underwriting and other bank functions are ramping up their oversight of outside firms and for some, the data management burden is not insignificant. This timely event will focus specifically on how risk managers can develop effective policies for managing outside vendors for appraisals and environmental assessments. EDR is pleased to host a webinar on this timely topic with Mitch Kreeger, a well-known subject matter expert on valuation, environmental and seismic risk, and regulatory compliance topics, will share his insights and advice on establishing an effective vendor management policy for appraisers and environmental professionals. Kreeger will explore the myriad ways that attendees can improve vendor management, from initial project bidding to vendor selection to monitoring vendors over time. • What should we consider in selecting the “right” vendor for the job? • How do we find quality appraisers? EPs? • What guidance should our institution be giving our appraisers and EPs? • What criteria should we be using to grade vendors and monitor performance? • How are banks facing today’s vendor management challenges? EDR exists to provide those involved in real estate transactions with the information and solutions they need to assess, understand and manage environment risk. Presented by: David Gillay, Barnes & Thornburg and John Sallman, Terracon Consultants, Inc.